I must sound like a broken record to some people about New Orleans and its unique spirit. But its true – its a distinct city with a culture all its own unlike anywhere in the United States of America or on the planet. Yes there are shades of French culture, sparks of Brazilian carnival and layers of southern tradition and hospitality in this city. But once its been through the mix that is New Orleans, it becomes completely local. When I hang out in this city – there’s always reminders of its unique events everywhere – a bit of Mardi Gras, a bit of JazzFest and a dash of voodoo, thanks to Marie Laveau, a former resident. 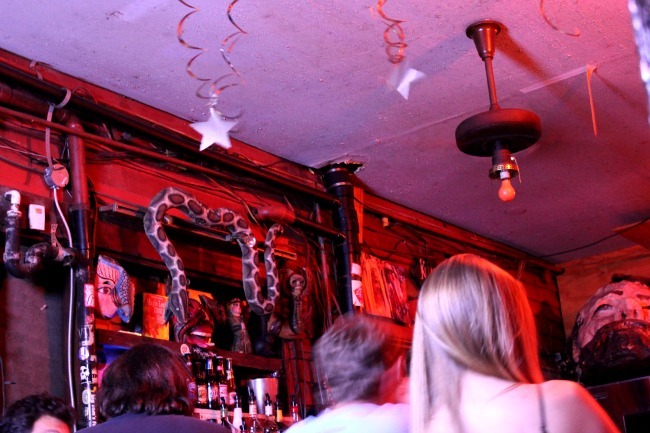 So as I looked up at the decor above the back bar at the Maple Leaf Bar, it was no surprise to me to see a snake, voodoo dolls, music posters and a piece of a Mardi Gras float. And don’t worry, there will be a uniquely dressed person along soon – as if there’s a parade to attend.